Speranza Animal Rescue found this disfigured girl after a volunteer sent them a picture of her at the shelter. With just one look at her face, they sprung into action to bust this helpless girl out. They expected to meet a timid dog, but what they got was one of the happiest pups you could ever meet. 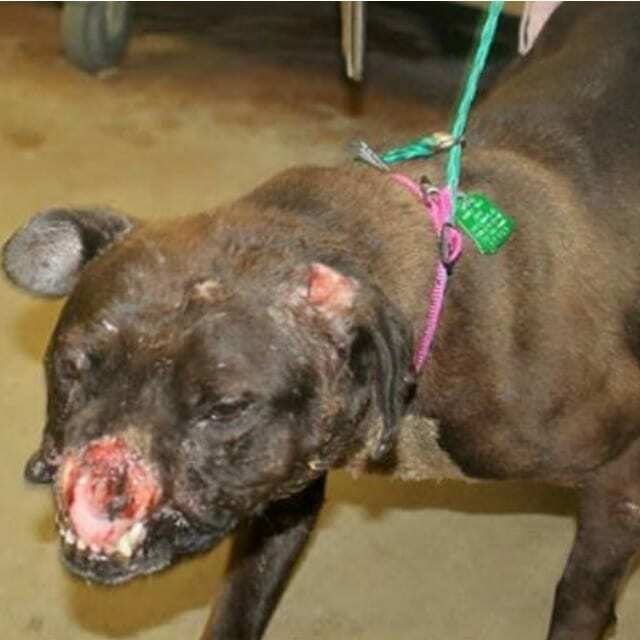 She had suffered trauma to her face and an abundance of scars that indicated she may have been used in dog fighting as a bait dog. It was in that moment that the name “Mona Lisa” was bestowed upon her by her rescuers. After her rescue, Mona spent several months at a veterinary clinic undergoing multiple surgeries before she made her way to Speranza Animal Rescue. Mona Lisa has now become a very special ambassador for Pit Bulls, and has proven that even in spite of her past, she still trusts and shows ample affection toward humans. She routinely puts a smile on people’s faces at rescue events and at the nursing home, which she visits twice a month. This tenacious pup has beaten all odds and obviously has a heart of gold. Without her strong will and dazzling personality, she may not be making so many others happy. Thanks to all the efforts by Speranza Animal Rescue, Mona Lisa is now among the joyous rescued Pitties of the world.